This is a guest post from Alissa Oginsky, a museum educator and 6th-grade history teacher at Holmes Middle School in Alexandria, Virginia. Teachers are always on the hunt for new and exciting ways for students to exercise their critical and creative thinking skills. The journey, in fact, never seems to stop! Like many history teachers who have projected, printed, hidden parts of, and even cut up primary source images, I have seen the incredible power primary sources offer by giving students the opportunity to investigate, grapple with, and draw conclusions about the past. Finding new and valuable ways of assessing student comprehension visually is of special interest to me, especially because English-language learners make up approximately 25 percent of my school’s population. 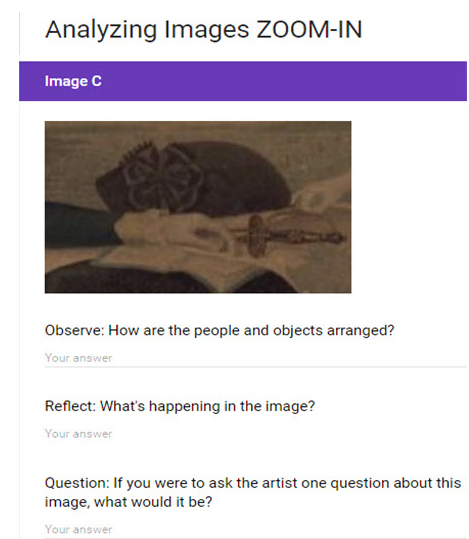 Recently I’ve discovered Google Form Zoom-ins, which provide a twist on traditional primary source analysis techniques to better support students in constructing deeper connections and hypotheses, while also promoting advanced collaboration between students. Using Google Form Zoom-ins is just one small shift I’ve made to a blended learning environment, which “refers to a spectrum of teaching modes that combine traditional face-to-face instruction with work done online” (Tucker, 2012). Changing my mindset to be more “blended”, particularly in terms of integrating a variety of digital assessment mechanisms, has provided students with flexibility in the pace, timing, and delivery of their own learning. As luck would have it the shift towards a more student-centered classroom, with only a few minor bumps, has really paid off. I’ve found that it is so much more enjoyable and easier to support the development of historical thinking and 21st-century skills. I’m happier. The students are happier. It’s a win for us all! As you can see in this Google Form Zoom-in example, I’ve taken direction from the Library of Congress primary source analysis tool. The activity incorporates several best practice “Observe, Reflect, and Question” inquiries that require students to truly think like historians. Because we spend much of our 18th-century America unit studying colonial social roles and how they differed between colonial regions and classes, The Washington family print is a perfect primary source. Analyzing the symbolism of the sitters, setting, and objects within this portrait provides an opportunity to assess student understanding of the culture and society of the southern gentry and George Washington. This Google Form Zoom-in, however, is not just a summative assessment tool. It also serves as an influential resource for teachers to more easily assess the formation and evolution of student thinking. Assessing thinking skills can be a challenge, but a tool like this can really help! Students made connections between their thinking along the way and the full image revealed at the end of the activity. It is clear, Zoom-ins using Google Forms foster collaboration between students and engage them in meaningful conversations. Because students loved this activity, student engagement soared! Check out some of the written feedback from my students below. My experience was very interesting. I liked how you could guess and make a hypothesis as to what was in the images, and why they were there. Zoom ins is a good website it good because it going ask u a lot of question and it talking about george washington’s family. and i like it about because it going to going to help u history. I liked putting the puzzle pieces together to find out what the picture represented. I had a fun experience. I like the mystery and challenge in finding out the picture. There is no better way for my students to examine the past than to be immersed in primary source investigations. Zoom-ins using Google Forms support the development of historical thinking skills while providing rich, engaging blended-learning opportunities for my 21st-century students. Don’t miss the other posts in this series from the fabulous Fairfax County Public Schools teachers!